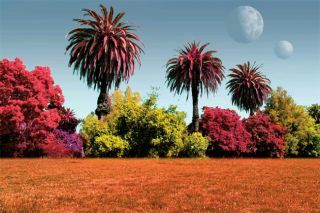 An artist's conception of colorful plants on distant worlds. A new study finds otherworldly vegetation could be red, orange or yellow. If trees grow on other planets, their leaves might be red, orange or yellow, and not only in autumn, scientists say. Two new studies detailed in the March issue of the journal Astrobiology find that the color of a planet's photosynthetic organisms depend on the type of star the world orbits and the makeup of its atmosphere. "You have a particular spectrum which is affected by the star's surface temperature, but once that light comes down through the atmosphere, the atmosphere filters that radiation," said study team member Victoria Meadows of the Virtual Planet Laboratory (VPL) at Caltech. For example, our Sun radiates most of its energy in the green part of the visible spectrum. But ozone molecules in the Earth's atmosphere absorb much of this green light energy, allowing other colors, especially red, to filter through to the ground. This could explain why chlorophyll absorbs mostly red and blue light and reflects green light, the researchers say. "Ozone filters out some of the blue-green radiation, so there's less of that available at the surface of the planet," Meadows told SPACE.com. Alternative explanations have also been proposed for the greenness of plants. One idea, called the purple Earth hypothesis, states that chlorophyll doesn't absorb green light because it appeared after another pigment, called retinal, was already present and it had to settle for the "leftover" wavelengths that were not being absorbed. The researchers reached their conclusions after analyzing 12 different kinds of light-sensitive pigments, including chlorophyll, that organisms on Earth use to harness the Sun's energy. The researchers want to use their findings to guide the search for plant life on other worlds. To that end, Meadows' team at VPL entered the results of the pigment analysis study into a computer simulation that predicts what the light from a distant planet containing photosynthetic organisms will look like to space telescopes. For example, in addition to reflecting back visible green light, organisms on Earth that use chlorophyll for photosynthesis also reflect near infrared light. This reflected light can be seen from space and is called the "red edge." The new findings suggest photosynthetic organisms on other planets might not produce a red edge, but some other biosignature instead. The researchers want to figure out what those alternative biosignatures might be. "We're coming up with rules so that we can say more confidently what is photosynthesis when looking at spectra from these planets," said study leader Nancy Kiang, a biometeorologist at NASA's Goddard Institute for Space Studies in New York. Whether or not scientists find life on distant worlds could depend on these rules. "When we look at these faraway planets, we're not going to be able to spatially resolve them. We won't be able to see continents and oceans," Meadows said. "Everything we must learn about that planet will be in a single dot of light." Already, the researchers think they can already make certain generalizations about photosynthesis in the universe at large. It's unlikely, for example, that plants on alien worlds will be blue. "It appears that harvesting blue light is very common across the board for photosynthetic organisms" on Earth, Kiang said in a telephone interview. "I think it is unlikely that anything will be blue."